Margaret (Maggie) Adler is Curator at the Amon Carter Museum of American Art in Fort Worth, Texas, where she has organized or co-organized exhibitions on Audubon, hunting and fishing in American art, Winslow Homer and Frederic Remington, Samuel F.B. Morse, and Sam Francis, among others. Prior to the Amon Carter, Maggie held the Barra fellowship at the Philadelphia Museum of Art. She currently serves the field as co-chair for the Association for the Historians of American Art. Though her scholarly research focuses on nineteenth-century art, she is also passionate about collaborating with contemporary artists in helping them with large-scale commissions and has worked with Jenny Holzer, Pepon Osorio, and Gabriel Dawe on site-specific installations. She is currently planning a major commission with artist Mark Dion and collaborating on a traveling exhibition pairing Winslow Homer and Frederic Remington. She holds a BA in classical languages and art history and an MA in art history from Williams College. 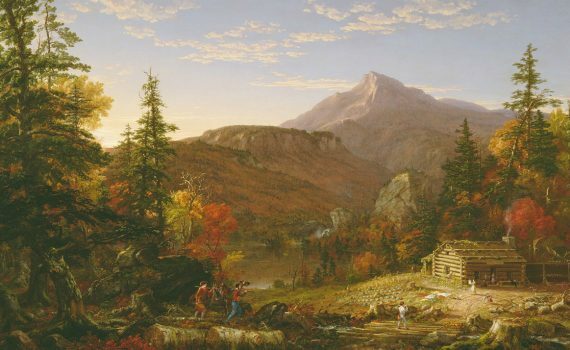 Cole feared for the American landscape as his country expanded westward.